Being both lightweight and rugged the Static V is an ideal sleeping pad for the avid backpacker to casual camper. A comfortable backcountry pad providing winter insulation and all-season comfort. The pinnacle of rugged luxury, Static V Luxe Sleeping Pad hits the sweet spot where comfort, technical performance, durability and lightweight packability come together. The popular Static V goes double-wide. A wide 188 cm width the Double V is perfect for couples camping and comes with its own air pump / stuff sack. The popular Static V goes double-wide. A wide 188 cm width the Double V is perfect for couples camping and comes with its own air pump / stuff sack. 4-season insulation. Being both lightweight and rugged the V Ultralite SL is an ideal sleeping pad for the avid backpacker to casual camper. Being both lightweight and rugged the Insulated V Ultralite SL is an ideal sleeping pad for the avid backpacker to casual camper. Combining our comfort technologies with our weight saving innovations, the Inertia O Zone is light, compact and supportive. One-of-a-kind design for a better sleeping experience. 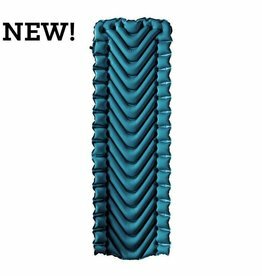 The original air pad by Klymit that changed the way people Sleep Outside™ - in a hammock.